Inequality within countries is a profound challenge to well-functioning societies. The international development community’s latest effort to tackle this challenge is the desire to Leave No One Behind. This principle, outlined in the Sustainable Development Agenda, argues that progress on the Sustainable Development Goals can only be viewed as progress if those most marginalised by poverty also benefit. For those who do not directly work in development, this may appear rather obvious. The sector’s raison d’être is to help those most at risk from social, political, economic and environmental concerns, and so it seem only right to measure progress by our impact in marginalised communities. Led by Selim Jahan, who also contributed to the 2016 Commonwealth Global Youth Index, the 2016 Human Development Report (HDR 2016), ‘Human Development for Everyone’, explores the Leave No One Behind principle and its potential contributions to human development. Referred to as universalism in the report, the HDR 2016 maps out the scale and nature of exclusion across the world, the drivers of exclusion and potential solutions at the national and global levels. The report is a comprehensive body of work and builds on many of the most important discussions in the development community. 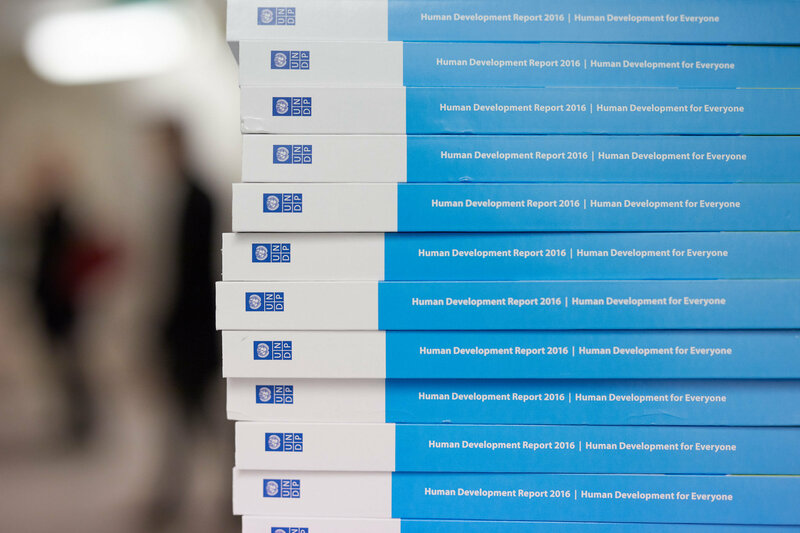 The HDR 2016 report highlights the normative shifts behind Leaving No One Behind and more broadly, inclusive development. It signals a shift from a state-led view of development to human-centred development. In the Millennium Development Goals, we measured progress with country averages, often missing out on the variation of development outcomes between different groups. In measuring variation of outcomes between individuals, as opposed to households, communities and groups, we are deepening our understanding of what development means to different people. This offers important opportunities to improve the way we create programmes and policies. The report views leaving no-one behind as a continuous process, one which involves trade-offs between different groups. As noted in page 65 of the report, ‘who is left behind, how and why are questions with different answers in different places at different times.’ Disaggregated data plays a critical role in measuring the complexities of poverty and progress and deepens our understanding of what development means to different people. However, it only tells us part of the story. It tells us what, in detail, is happening but it does little to explain why. When I was working to promote women’s entrepreneurship in Israel and Lebanon, we noticed that the entrepreneurs gave contradictory figures around their income. Through discussions with the women, we started to understand why the data was inconsistent: the women were unsure how to count profit and revenues, were afraid of what their spouses might think or indeed that they might have to hand their earnings over to their spouses. Without these discussions, it would be difficult to make sense of the data we had gather on women’s financial inclusion. The HDR report is unique in advocating the importance of understanding the nature of exclusion within a broader context. The report proposes that development work should create models that ensure people are not left behind both now and in the future. In short, inclusive development can only be progress if it is sustainable. At present, inclusive development is mainly advocated for by civil society groups as an issue of justice (development should be equal) and by governments as an issue of efficacy (development should produce the most gains). But framing inclusive development as an issue of sustainability might provide a way for the private sector to champion the ideals of leaving no one behind in the same way they champion environmental sustainability vis-à-vis the Sustainable Development Agenda. Marion Osieyo is a development practitioner specialized in global governance and social development. Over the past five years, she has worked in Europe, Sub-Saharan Africa, Middle East, and South-East Asia supporting social and economic development for women and youth. Marion holds a Master of Science in Global Governance from the University of Oxford.